Do not invoke Export as SYSDBA. SYSDBA is used internally and has specialized functions; its behavior is not the same as for general users. BLOCKS (default). The estimate is calculated by multiplying the number of database blocks used by the target objects with the appropriate block sizes. or STATISTICS. The estimate is calculated using statistics for each table. For this method to be as accurate as possible, all tables should have been analyzed recently. The LOB is not accounted for with the estimate in DataPump. With the parameter ESTIMATE_ONLY you can estimate the space in bytes that would be consumed without actually performing the export operation. Using this Parameter will not generate the dump file other than a logfile (if specified). The ESTIMATE_ONLY parameter causes export to estimate the space needed, by multiplying the number of database blocks used by the target objects times the appropriate block sizes. The value for this parameter is either Y (yes) or N (no = default). Y: Export estimates the space that would be consumed, but quits without actually performing the export operation. 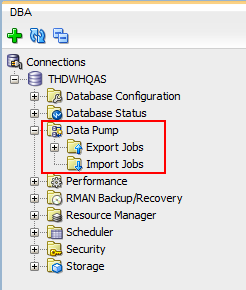 N: Export does not only estimate, it performs an actual export of data, too. If the job is no more running, just suppress this master table.